If you're tired of struggling with your golf backswing, boy do I have a treat for you! This simple training aid will make learning the backswing dramatically simpler and faster as it provides one of the most valuable feedback mechanisms for learning the RotarySwing - instant feedback. When you make a mistake, the RotaryConnect golf training aid lets you know by allowing your arms to fall out of the cuffs. This is the HUGE difference between this golf training aid and others such as straps or a belt wrapped around your arm. Those encourage you to push OUT on them during the golf backswing, whereas this encourages you to apply pressure to the inside. This teaches you the correct musclular activation so that when you take the training aid off, you still perform the backswing the same way. If you take a strap or belt off, you'll likely go right back to your original swing fault because it is teaching you to push out, which is what you are already doing or you wouldn't need this training aid in the first place! 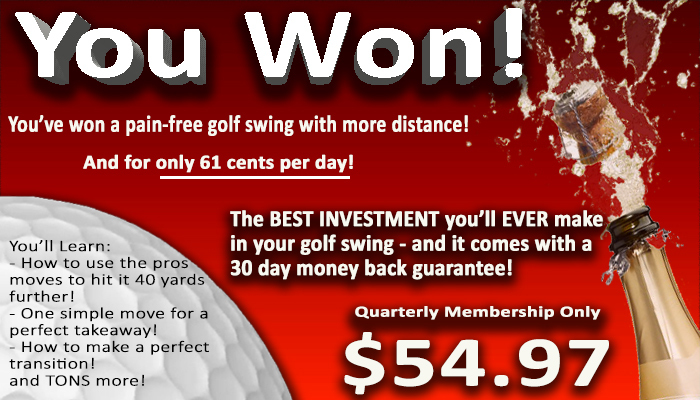 So, pickup your RotaryConnect today and get on the path to mastering your golf backswing today! While this may look like a set of Harry Houdini handcuffs, I'm going to show you how this is going to be your absolute new best friend when it comes to working on your golf swing. This simple little device is probably one of the most profound training aids that I've ever used or found in my 20 years of playing golf. The reason is, A, it's really simple. B, it's really inexpensive. And C, it's really effective. It does so many things for your golf swing that all golfers struggle with, that it's going to make the learning process so much smoother and faster than any other way of doing it. The piece I'm going to talk about today is, going back in the back swing. How it helps with developing a proper back swing and how it keeps you from doing so many common faults that so many golfers have. I'm going to show you how this works. It's very very simple. I've got it on the narrowest setting. I'm going to keep my arms close to my body. All I do is snap it over my arms. Now my arms are going to be forced to work in sync with my body. I can't take my left arm and just roll it over, because it's going to ram into my body. I can't disconnect my right arm away and just take the club back this way. It's going to teach me synchronization. As I turn back, my arms and everything are moving back perfectly together. When we grab a golf club, my take away, that five minutes to the perfect take away video that everybody should be working on and mastering is so incredibly simple. I don't have to think about what my arms are doing. It's taking care of all that for me. If we look down the line, all I do take the club back, turn my body and my arms are staying perfectly in sync with my body. Now, so many golfers, when they work on the take away they do this, they roll it in, their arms are moving too much, they're pushing the left arm across. Pulling up with the right arm. This won't allow you to do that. Just takes away all of the mental process of having to think about everything. It gives you a feeling of what those positions should feel like. Now, this becomes especially important when we work on five minutes to the perfect back swing and we get ourselves in out position at the top. This keeps the arms from working away from each other because you'll come out of the device. Now, once we master the take away. Keeping out arms ... We've got our width here. Everything looks great. As I go to the top, now my arms can stay in sync the whole time. My arms are staying perfectly in front of my body because if I don't, if I do something wrong, it's going to fly out. My arms are going to come out. By keeping my arms gently touching, not smashing them up inside but touching the inside of the cuffs. I can get to it to myself to the perfect position at the top every time and feel whether or not my arm's drifting away, if my left arm moves away from the cuff here. I know that I'm getting disconnected, so I just keep my arms gently touching the inside of the cuffs the whole swing. All the way to the top of the swing and now I'm in a great back swing position. Just dramatically simplifies everything. Now on the down swing, the same thing happens. Now we've got the benefit of learning how to keep the arms together on the down swing, because so many golfers, as they come down they start doing this kind of stuff and their arms are out of sync. They can't release it correctly because they're flipping it and so their arms are changing. There are all kinds of bad faults in the downswing that people can do. This addresses them very very simply by teaching you what really, a lot of what RST is really all about. Is keeping the arms moving in the right sequence with the body. By doing this it makes them do that. Now as we come down from the top of the swing, as we come down now my arms are in sync. They're in front of my chest and now most important of all, they're in front of my chest at impact. I'm at a great impact position and now I can release the golf club and my arms are still in a great position. It doesn't allow me to flip my arms over each other and try and do something crazy. It doesn't allow my arms to separate from each other. It doesn't allow me to get in all these bad positions. It puts me in the right position, working on all the things that RST is all about. Keeping your arms in front, using our body to take the club back. Moving in the right sequence on the down swing. Simple little device, works awesome for everything that your arms need to do in the back swing and the down swing. It's a no brainer. If you're working through the RST program, you're working on different videos like five minutes to the perfect take away. Five minutes to the perfect back swing, et cetera. This devices will help get you the feelings of how to do it correctly every single time, without having to have an instructor sitting there and watching you all the time. Definitely pick one of these up. Start working on the drills and the drills are listed on the site for the nine to three drills, the three quarter shot drills and the full swing drills and this will dramatically simplify your thought process and turn it into subconscious where you're feeling what you're trying to do and make your golf swing, the process of learning, a lot faster. Get Your Free Membership to Finish Watching "RotaryConnect Backswing Training Aid" Right Now!